Casandra Light supervises as fellow members of the Bass Reeves Gun Club (the founding chapter, based in Atlanta, of NAAGA) target practice. A national gun club for Black Americans has seen its membership surge since the election of Donald Trump. But with many members carrying NRA cards, the club refuses to be politically pigeon-holed. In the back of a shooting range in northwest Atlanta, behind glass doors marked "Members Only," Marchelle Washington presides over a discussion among 20 Black women. "Who here is looking to buy a handgun?" she asks the women, most of whom are members of, or are seeking membership in, the National African-American Gun Association. The two-year-old organization advocates for gun ownership in the Black community and is open to men and women of all political persuasions. 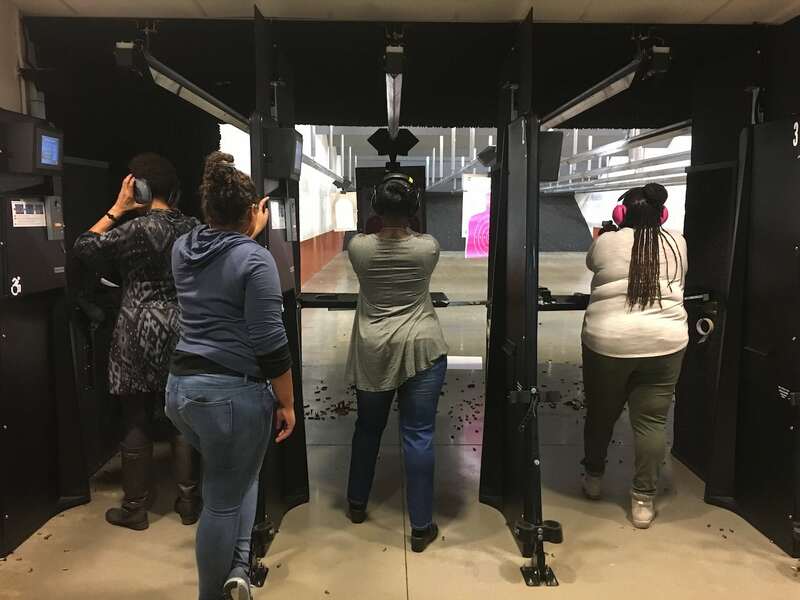 Twice a month, the Atlanta chapter hosts a Ladies' Day Out, beginning with a discussion and then proceeding to the firing range for target practice. "Actually," answers a young woman named Casandra, "I'm in the market for an assault rifle." The women launch into a discussion of the pros and cons of magazine-fed semi-automatic rifles. "I like the kickback on the AR-15," offers Washington. "I shot a Kel-Tec and got a bruise," Casandra admits. There’s general laughter from the couches where the group sits in a loose circle. Washington seizes on the moment to steer the conversation away from gear and back to fundamentals. "Well, what's worse? Home invasion and death—or a bruised shoulder?" Rait Kaneset is a new member of the Atlanta NAAGA chapter. This shift has not occurred as a silent stockpiling. During this period of growth, the NAAGA emerged as a way for many Blacks to announce themselves as gun owners and partisans of the Second Amendment, prepared to defend themselves in a violent society where Blacks are far more likely than whites to die a violent death. Founded in February 2015 in Atlanta, NAAGA now claims around 20,000 members nationwide. It is organized into 48 chapters, which hold meetings, offer firearms training, and advocate for gun ownership and self-reliance. Although leadership of the chapters skews male, NAAGA reports that the majority of its members are women. According to NAAGA President Phillip Smith, the fastest period of growth took place in the few months after the election of Donald Trump. Membership numbers “jumped off the roof,” Smith told CNN, pointing to 9,000 sign-ups in the four months between Election Day 2016 and the end of February 2017, as well as a spike in new chapter formations from Dover, Delaware, to Oakland, California. Smith tells Scalawag that, in addition to the perpetual threat from neighborhood crime, the heightened visibility of white supremacist hate groups after Trump’s election has made people of color “very, very cautious.” According to FBI statistics, hate crime rates surged at the end of 2016. The Southern Poverty Law Center documented 867 cases of hateful harassment or intimidation within the ten-day period following the November 8 election. "Well, what's worse? Home invasion and death — or a bruised shoulder?" The NAAGA chapter in Dover is one of those founded in response to Trump. Founder and president Gary Lewis relates how a series of suspected KKK-related crimes in his city over the course of several years weighed heavily on his mind. Lewis, a gun owner, looked around for an organization that could address his outrage and, at the same time, embrace his right to arm himself. “There are a lot of so-called progressives who immediately shut down when you want to talk about guns,” Lewis said. He organized the first Dover NAAGA meeting in October of last year, bringing in a modest dozen members. For Lewis, NAAGA was the best fit. Unlike the Black Lives Matter movement, NAAGA advocates for the right of citizens to bear arms without the National Rifle Association’s right-wing political baggage. But exactly where NAAGA’s political flag should be planted is still a point of debate within the group. A clerk at Stoddard's Range and Guns assists Casandra Light as she shops for a rifle. Some of the local NAAGA chapters intentionally call upon the history of the Black Panther Party, which advocated Black gun ownership in the 1960s and 70s as a tool for policing the police. While the Party fought for community self-reliance in the form of free breakfast programs and reading groups, it was their open-carry habits that drew the most attention from media and lawmakers. In fact, their liberal exercise of the Second Amendment inspired California Republicans to draw up the 1967 Mulford Act to ban open carry in California. The act was supported by the NRA and signed into law by then-Governor Ronald Reagan. The Bobby Seale Gun and Rifle Club in Los Angeles—a NAAGA chapter—takes its name from the co-founder of the Black Panther Party, and several other chapters have posted on their Facebook pages in support of the Party’s legacy, although they declined to talk to Scalawag. At the national level, however, NAAGA maintains a strict distance from the Black Panthers’ radicalism. People come to NAAGA, he says, for many of the same reasons they would sign up for the NRA: self-protection and sport. In fact, the two organizations have, in Smith’s words, a “respectful” relationship. He attended the NRA’s annual national convention in April, which was held this year in Atlanta and featured a keynote by President Trump. And while Smith is not a member himself, he says many NAAGA members are. The NRA did not respond to repeated queries about its relationship with NAAGA, but the organization has featured an interview with Smith on its NRA-TV channel and celebrated NAAGA’s one-year anniversary on its blog. There are a lot of so-called progressives who immediately shut down when you want to talk about guns. Indeed, many NAAGA members don’t like the NRA, a decidedly right-wing organization whose Board of Directors includes the likes of Iran-Contra conspirator Oliver North and overt racist Ted Nugent. After an hour of target practice at Stoddard’s Range and Guns in Atlanta, trainer Marchelle Washington sits down and takes off her ear protection. A veteran of the National Guard and an NRA-certified firearms instructor, Washington turned in her NRA card because she didn’t like its politics. Marchelle Washington, a NAAGA member. She led a “Ladies Night Out” discussion with 20 Black women in northwest Atlanta to discuss gun ownership and use. “It's just fear mongering,” Washington said. Perhaps the most fragile moment in the relationship between the NRA and NAAGA came this summer when the officer who shot Philando Castile to death during a traffic stop was acquitted of all charges. Before reaching for his wallet, Castile had warned the officer that he was legally carrying a firearm. The officer became nervous and, as Castile made for his pocket, shot him five times in the chest in front of his partner and her child. Many members of NAAGA saw in this case the criminalization of Black gun ownership. It was a scenario that NAAGA trains its members to deal with: how to de-escalate a confrontation with law enforcement while carrying. Castile had made a good-faith attempt, it seemed, and still lost his life. Yet the NRA’s reaction was uncharacteristically apolitical and reserved. “The reports... are troubling and must be thoroughly investigated,” read the statement issued a day after Castile was killed in 2016. A year later, after the officer was acquitted, the NRA finally broke its silence. An NRA spokesperson—Dana Loesch again—called the incident a “tragedy that could have been avoided,” but said that the NRA chose not to come to Castile’s defense because he was in possession of marijuana at the time of his death. The NRA’s timidity angered Saleem Gilmore, founder of the Oakland Chapter of NAAGA, but didn’t surprise him. “They don’t seem to care when a Black person’s life is at stake,” he tells Scalawag. In the meantime, Gilmore says, it is a “sign of maturity” to be able to unite around a single issue. And so, as if until further notice, they work in parallel, the NRA and NAAGA, empowered in perpendicular ways by the Second Amendment. Their token of commonality is not political but tactical. They are bound by the gun, the symbol of American self-reliance; a personal, portable judicial system for those who distrust the one we have, whether that’s because the the one we have is racist—or is not racist enough. The characterization of the attack on Pulse as “the worst mass shooting in our country’s history” provides no way of understanding and historicizing this massacre—demanding national mourning while eliding a long history of racial violence.